Learn to perform initial inspection of electrical installations with this fully accredited City and Guilds Level 3 training course. This course is recommended for practisting electricians who are yet to perform initial inspection on electrical installations, or those with previous experience in this field looking for an update on their previous training. The City and Guilds 2391-50 Initial Verification course is also suitable for those entering the industry from other disciplines (for example other engineering fields, or those who have been working in allied trades). Upon completion of this course you will be fully prepared for completing initial verification on electrical installation work. We will be running the City and Guilds 2391-50 Initial Verification course at our Watford, London and Stockton-On-Tees, Teesside electrical training venues. Are There any Qualifications Needed to Attend the Course? Although there are no qualifications required for this electricial verification course, it is expected that you should have basic knowledge and understanding of electrical science and principles/experience of electrical installation work either within the electrical contracting industry or an allied trade. Please call our training team for more information if you are concerned about your eligibility. This course will include a multiple choice examination (40 questions – 80 minutes), a short answer test (1 hour) and a practical test (2 hours). 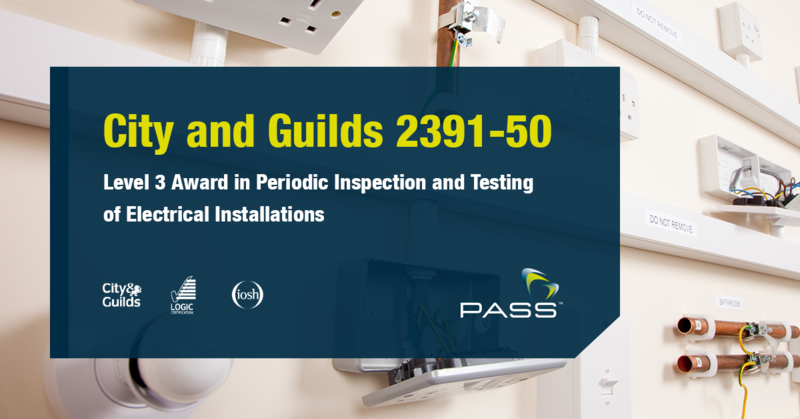 City and Guilds 2391-50 is both a theory-based and a practical course; you can both expect to be in the classroom carrying out important theory based on initial verification and you can also expect to gain practical experience on our in-house electrical training bays. Taught by our experienced, friendly and helpful electrical training tutors, we will guide you through all of the modules and prepare you as much as possible for the examinations and practical assignments you will have to complete at the end of the course. We try at all times to keep our training groups with a small group of learners to ensure you get plenty of one-on-one time with our tutors, to ensure all of your questions are answered and to ensure you always get the best electrical learning experience. Those who successfully complete with course will receive a City & Guilds 2391-50 Level 3 Award in Initial Verification. In this section, you’ll put everything you’ve learned into practice and complete the tests needed to perform inspection/testing on electrical installations. You will also be expected to complete any relevant documentation as part of the process. Both books are sold through our test equipment website, tester.co.uk, click a link above for more information on each. You can use both these books during examinations on this course. Q – When Will the 2394/95 courses finish? A – Last registration for City and Guilds’s older courses will be at the end of August 2017 and you will have until August 2018 to complete these courses. Q – Does this mean the 2394/95 courses will no longer be relevant? A – No, the 2394 and 2395 courses will remain an acceptable Level 3 qualification. Those already with this qualification do not need to take the new 2391 course(s). Q – I was unsuccesful with some of the elements of 2394/95, can I still retake this course? Q – Have any of the exams changed for the new courses?